Modus S. Traditional casement window design delivering market leading efficiency. New Modus S - the latest addition to our successful and highly innovative Modus window system range - offers an ideal method of maintaining a traditional cottage or Victorian facade while meeting demands for the highest levels of energy efficiency. 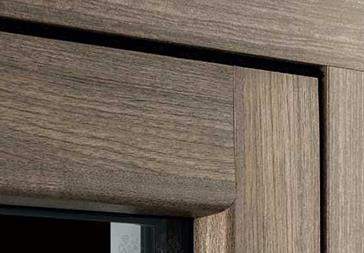 Its flush profile, achieved using a unique 75mm six chamber system, precisely echoes the appearance of traditional timber frames - an impression enhanced by a choice of realistic woodgrain finishes and a new joint detail that eliminates diagonal corner welds. The authentic appearance of Modus S makes it perfect for period renovation or premium new build projects in which clients or homeowners are seeking a traditional aesthetic. It’s also well suited to conservation areas and listed buildings where planning regulations mandate window frames in a traditional style. Up front and whole life costs are improved too, as Modus S is up to 25% less expensive than equivalent flush PVC-U systems and guarantees a virtually maintenance free performance. Excellent energy efficiency puts Modus S close to the top for environmental performance. Its 6 chamber profile helps achieve a U-value as low as 0.7 - even better than Passivhaus standards - and it was one of the first flush PVC-U frames to be awarded the new A++ rating for efficiency by the BFRC. So you can be sure of satisfying building regulations and your customers’ requirements for a more economical home. The Modus and Modus-S systems are certified with the BBA (British Board of Agrement) for thermal performance, weathertightness, ventilation, resistance to intrusion, access and durability. Bellway Homes specifies innovative new Modus. Cost effective to install. Cost effective to run and maintain. Complement the pastoral setting.